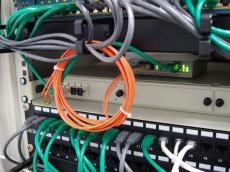 Azerbaijan’s state communication operator Baku Telephone Communication LLC is launching the next stage of expansion of broadband internet access using GPON (Gigabyte Passive Optical Network) technology, the Ministry of Transport, Communications and High Technologies said in a message April 9. The ministry said the infrastructure created by the operator allows to connect about 30,000 households to broadband services within the first stage. “Presently, about 9,000 households are already benefiting from the GPON network, and the second stage of the project will start soon, within which infrastructure will be created to connect about 100,000 households to the GPON network,” the ministry said. The GPON technology allows to provide Triple Play (VoIP, Data and IPTV) fiber-optic cable services, and its high data transfer rate makes it possible to watch HDTV channels.